Its 2 days from Christmas but my mind is on design. You guys don’t know this but I have been living at home for the past couple of months. I’ve lived outside of my house since my Junior year of college but due to recent apartment issues and a realization that I don’t really enjoy living alone, I decided to move back home until I found an apartment in a neighborhood that I love and a roommate. Well fast forward almost six months and I think I found the place! Naturally, my design brain is in full swing and my decorating palm is itching. In my last apartment the aesthetic was very feminine, eclectic, with pinches of glamour but I quickly realized that while everything I chose was beautiful, it wasn’t really accommodating to my lifestyle. I have a large, grey, tufted, velour couch which I will keep, but almost all the other pieces will go. The side chairs I bought were too formal and low to the ground. They gave off a, “You’re not allowed to sit here vibe” and most times my guest ended up squeezing on the couch and I on the floor. The glass table was sleek but not so sleek when I continuously banged my knee against it. Mirrored side tables, never again… I hated having to windex anytime anything was on it. The rug while beautiful was a rough, wool fabric that was very itchy and not vauumable (I think I made that word up lol). Below is all my living room furniture. The couch as mentioned will stay but I am now dreaming of a new design that will lend towards a comfortable, still glamorous appeal and pieces that I will keep for years to come. I’ve been scouring catalogs to get inspired before I create a design plan and start purchasing new furniture but these are the looks I am leaning towards. The last time I decorated my living room, I fell in love with a room that was featured in Elle Decor and I bought specific pieces to copy that look, this time I want the room to evolve. This is just a starting point but I love that all the rooms while polished still invite you in. 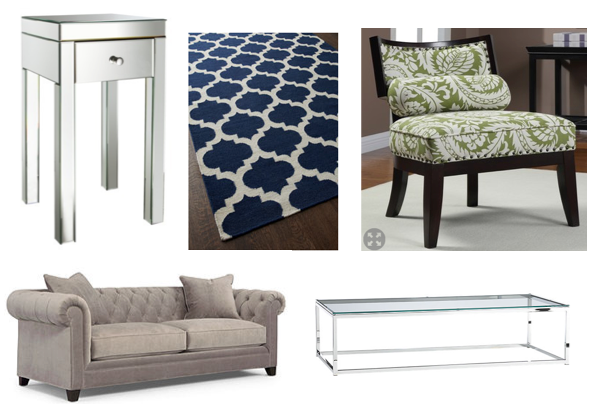 I want my next apartment to be beautiful but comfortable and I’m really excited to start decorating for myself again! Tags: aael, CB2, Chesterfield Sofa, Decorating, Design, Furniture, Glass Tables, HGTV, Ikea, Inspiration, Interior design, Interiors, Living Rooms, Living Spaces, Michael Gold & Bob Williams, Mirrored Furniture, Modern, Rugs, Velour Couched, West Elm. Bookmark the permalink.